Today, we launched version 5 of our visual development platform for Java and web developers. Java developers need the equivalent of MS Access for building Java Web Applications. Currently, a Java developer wanting to build a web application faces a huge learning curve, to say nothing of the coding burden. WaveMaker 5 addresses the need for easy to use tools for building Java Web Applications. 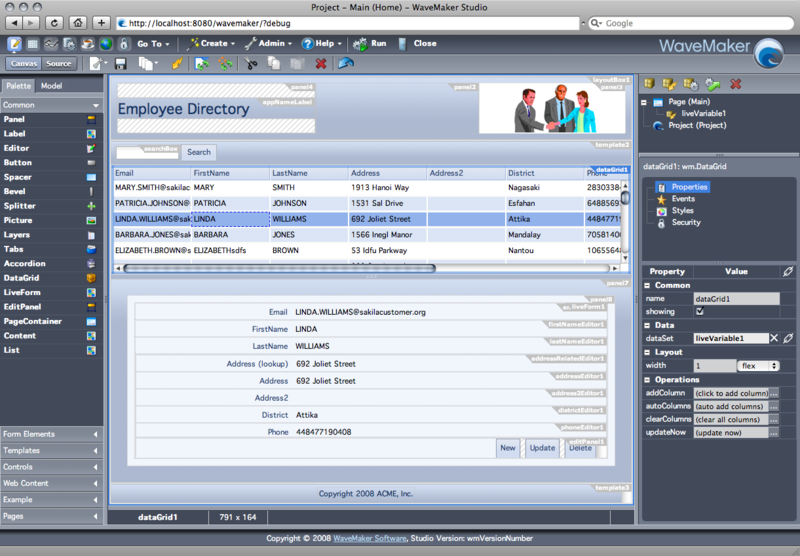 Wavemaker 5 introduces Enterprise-ready Data Widgets. WaveMaker generates these custom components automatically when a developer connects to a database. With Enterprise-ready Data Widgets, WaveMaker reads the database schema and creates a widget for each table that the developer can drag and drop into an application. Enterprise-ready Data Widgets can display table data as an Ajax grid or as a form with automatic data validation and built in create, update and delete capabilities. Click 1: connect to the database. 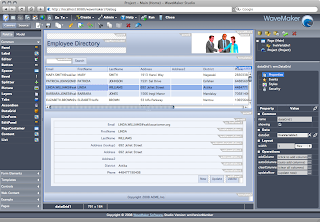 WaveMaker studio automatically imports the schema and creates an Enterprise-ready Data Widget for each database table. Click 3: press Run to perform a test run of the application in a local Tomcat server. The final application can deploy to any Java server. Try it today! You can download WaveMaker and try it yourself here.